A custodian is a person who is responsible for the health and maintenance of a person or an object given under their charge either by the terms of employment or by the judicial consensus when the custody of a person or an object becomes a legal question. Custodians can exist in many roles, and their jobs may vary depending on what they are responsible for. 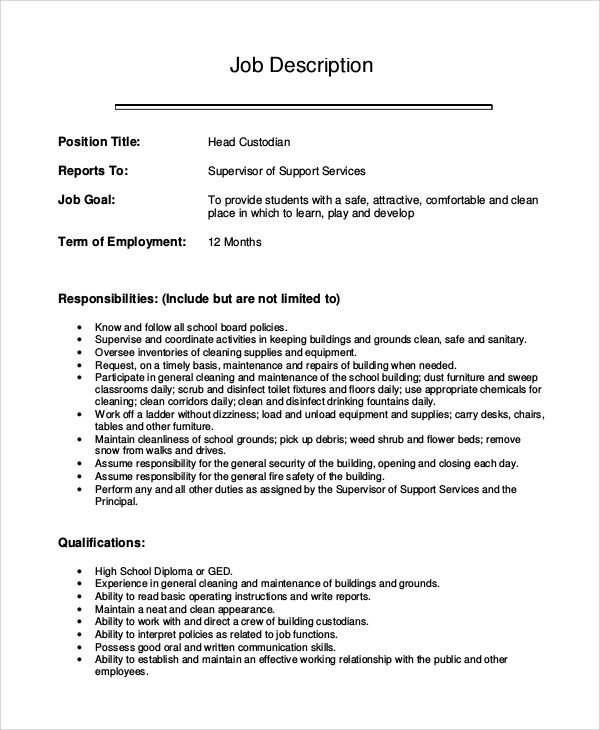 Given below is a list of Job Description Samples for various kinds of custodians. A janitor for a school or organization has the primary custody of the premises and its cleanliness. It is their responsibility to ensure that the premises and its parts are constantly kept clean, and necessary repairs are made to dilapidated objects. 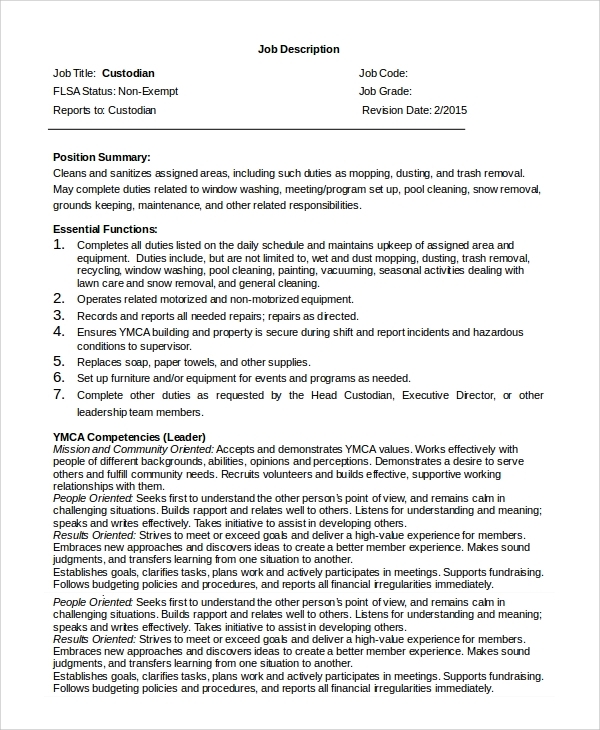 You can also see the Lawyer Job Description Samples. 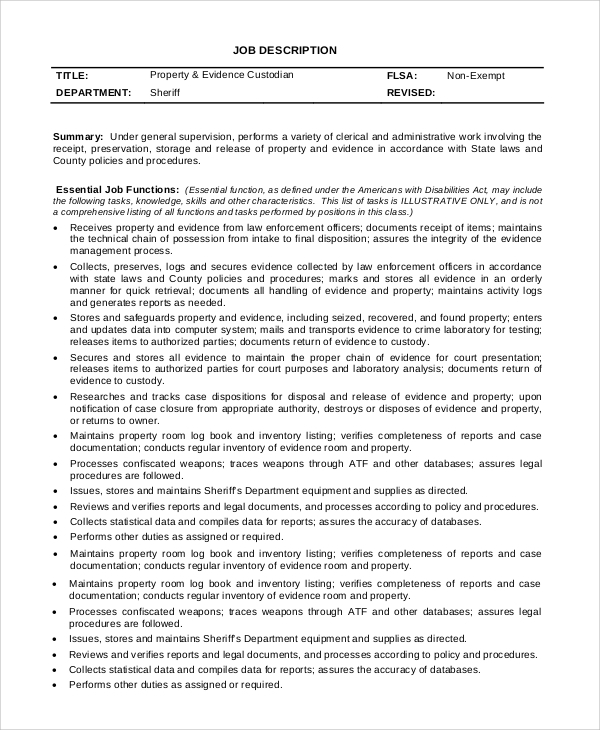 An evidence custodian is one of the most important jobs in the police and detective forces. They are responsible for maintaining the evidence from crime scenes and cataloging them so as to make an inventory of them to aid the investigation and the court proceedings. A head custodian is a person who leads a team of custodians to maintain the cleanliness and the professional look of premises. They need to be adept at being a good leader as well as being a good custodian, who would also be responsible for the premises’ security. The Sample Job Description for a custodian is useful for organizations and institutions which need a high degree of skill and competence to maintain the cleanliness, sanitation and general well-being of its premises. Such organizations are usually schools, colleges, and offices where the premises play a major role in driving the first impression for a visitor about the organization. So, custodian of particular premises requires alertness, responsibility and the ability to fix and clean objects as and when required. Often, the custodians are also responsible for maintaining the security of the premises where they work and which they look after. 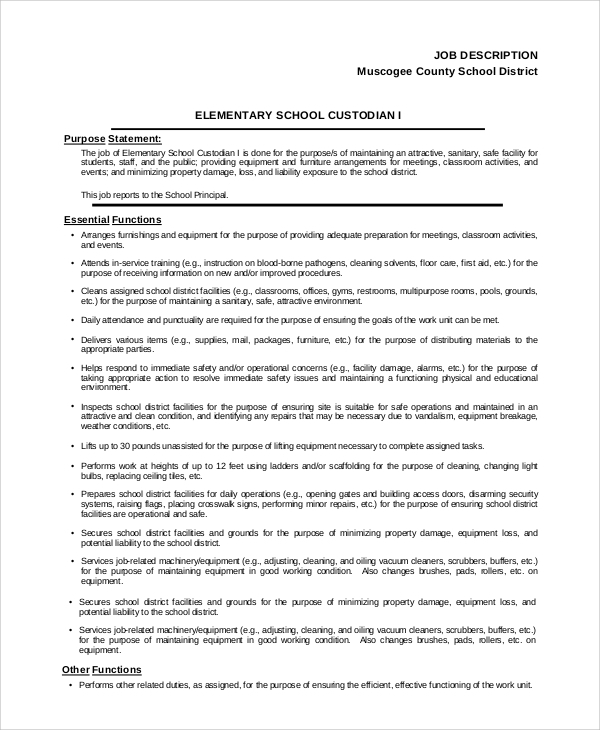 A school custodian is a person who is responsible for the maintenance and well-being of the school grounds and premises, along with cleaning of classrooms, disinfecting toilets and lunch areas and looking after the general conditions and security of the premises. 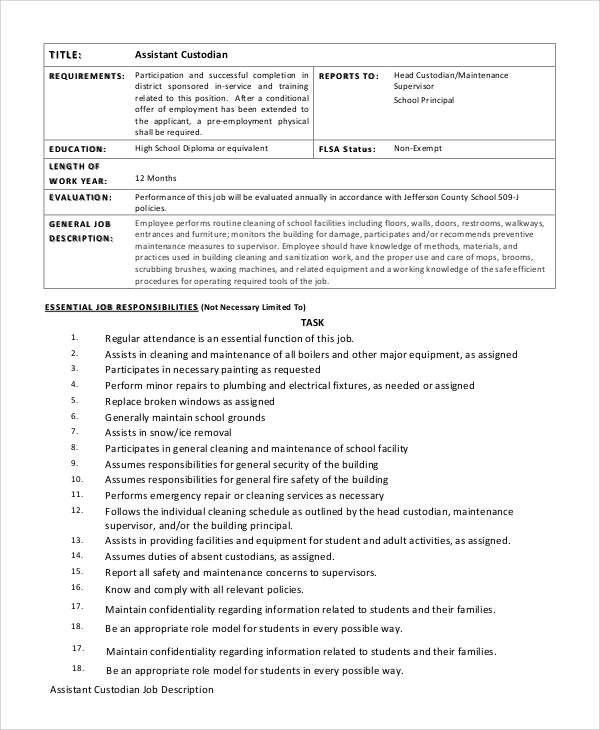 The job description sample for a custodian should clearly spell out the duties and responsibilities for a prospective custodian, instructing them about what is expected of them in their capacity as custodians. 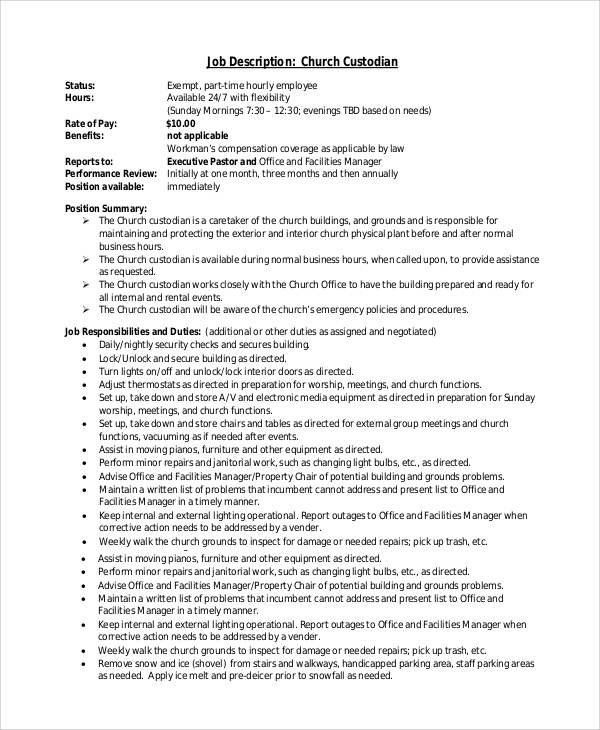 The Job Description are aimed towards those organizations that need its premises to be kept in tip top condition, so as to maintain the professionalism and formality that would be apparent from the looks of the grounds and the surrounding environment of the organization or institution. 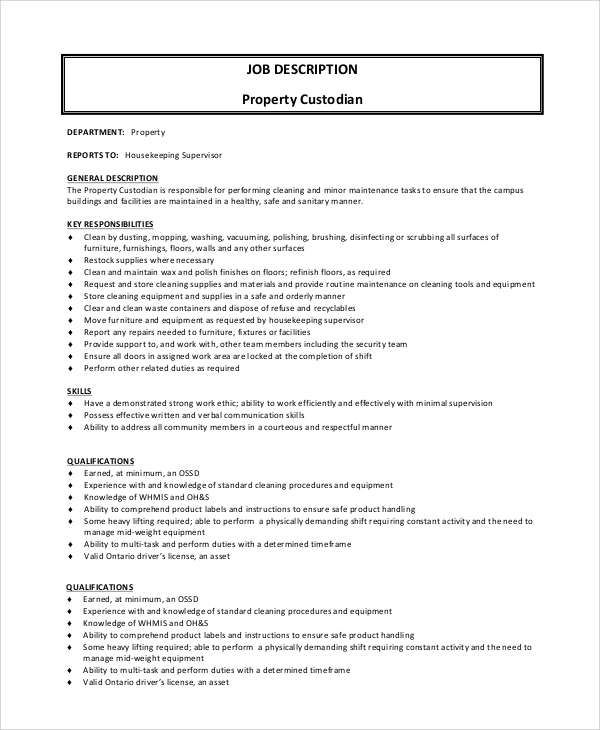 We have some Controller Job Description Samples with us. Select the one that suits your needs and utilize it as a job description of your own, our templates being completely editable. 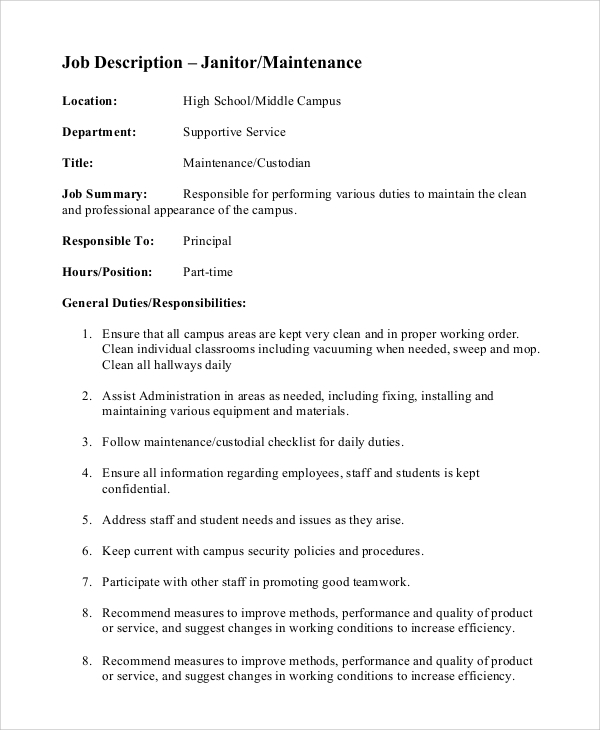 You can also use the templates as a guide for creating your job description for a custodian.